Totaling 103.02 miles in length, Delaware 1 provides the primary route between the popular Delaware Beaches of Sussex County with the Wilmington metropolitan area and points north into Pennsylvania via I-95. SR 1 was commissioned by 1974 to replace SR 14 northward from the Maryland state line at Fenwick Island to U.S. 113 north of Milford. The route extended north to Christiana in 1991 as work progressed on the U.S. 13 Relief Route, predecessor to the SR 1 Turnpike. U.S. 13 and SR 1 overlapped while construction took place to the 2003 completion of the toll road between Dover and South St. Georges. Korean War Veterans Memorial Highway Overview - background, maps and detailed history of the toll road. The state route runs north from the end of Maryland 528 at Ocean City through the coastal communities of Fenwick Island, South Bethany and Bethany Beach. The Coastal Highway opens along a narrow stretch of land separating Indian River and Rehoboth Bays with the Atlantic Coast along Delaware Seashore State Park. The signature Charles W. Cullen Bridge carries travelers across Indian River Inlet along the scenic four-lane highway. 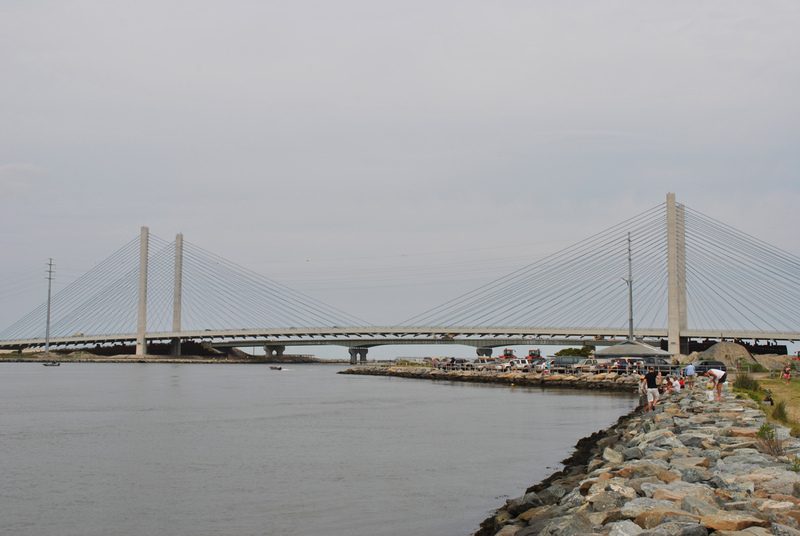 The Charles W. Cullen Bridge took four years to construct at a cost of $150 million. It opened initially in January 2012 and fully in May 2012. Photo taken June 18, 2012. Northward into the town of Dewey Beach, the divided highway transitions into a slow moving, four to six lane arterial. SR 1 turns away from the coast along a congested commercial strip through Rehoboth Beach and Five Points. Suburban development extends northwest along the route to Midway, where Delaware 1 (Coastal Highway) transitions back into a rural divided highway. Delaware 1 (Coastal Highway) ventures northwest from Midway across mostly open agricultural areas with four lanes and a grassy median. A signalized intersection currently joins Coastal Highway with Delaware 16 at Broadkill Neck. Future work, starting in summer 2020, replaces this at-grade connection with a diamond interchange. An older bypass alignment takes the route west of Argo Corners to the crossing of Cedar Creek. Just north of there, Delaware 1 reaches the city of Milford and exit ramps with Wilkins Road and Delaware 30. Construction for the folded diamond interchange with Delaware 30 took place between December 3, 2012 and July 23, 2014. It replaced an intersection with flashing lights. The state route bypasses Milford to the east along a controlled access expressway while SR 1 Business lines Rehoboth Boulevard through the city. A bypass was previously considered for either west of Milford, from the Thompsonville Road interchange to U.S. 113 south of the city, or between SR 1 near SR 30, and U.S. 113 south of the city. The Milford bypass includes wye interchanges with Delaware 1 Business and U.S. 113, and a diamond interchange with Delaware 36 (Cedar Beach Road). Construction from February 2018 to August 2019 adds a parclo A2 interchange in place of the at-grade intersection with Delaware 14 (NE Front Street) and New Wharf Road. Right in and right out movements replace the crossover at NE 10th Street as well. Delaware 1 overtakes Bay Road from U.S. 113 in north Milford to Dover Air Force Base. U.S. 113 was cosigned with the state route until 2004, when AASHTO approved an application by the state to truncate the route southward. Bay Road retains the characteristics of Coastal Highway through northern Sussex County with four lanes separated with a grassy median through mostly agricultural areas. Upgrades along the corridor between Milford and Dover have improved traffic flow and safety. Delaware 1 bypasses the community of Frederica to the east through an area of wetlands associated with Murderkill Creek. Frederica Road loops west from Bay Road to Front Street, where it becomes part of Delaware 12 east from Felton back to Delaware 1. Finished on June 28, 2011, a trumpet style interchange replaced the intersection with Frederica Road to the north. Subsequent work will add a partial cloverleaf interchange with new access roads in place of at-grade intersections with Frederica Road north, Milford Neck Road east and Tub Mill Road north. This two-year project commenced in spring 2016. Work started in February 2015 involving upgrades to SR 1 through Little Heaven focused on relocating 16,300 feet of sewer pipe. The utility work was completed in October 2015 in preparation for shifting the state route to the east.8 The old lanes were converted into a west side service road adjacent to the new SR 1 expressway. Exit ramps replaced the signalized connections with both Bowers Beach Road east and Clapham Road (former U.S. 113 Alternate) north. At-grade intersections with Barratts Chapel Road west and Skeeter Neck Road east were replaced with right in and right out connections. Phase 1 road work started in November 2015, with Phases 2 and 3 following soon there after. Construction extended through Fall 2018. With the exception of two driveways and a farm access road, completion of the Little Heaven Grade Separation project will extend the controlled access portion of Delaware 1 southward from Barkers Landing and the St. Johns River. The remainder of Delaware 1 north travels as a limited access highway to the Korean War Veterans Memorial Highway (SR 1 Turnpike) at Dover Air Force Base. Inlet Road winds south along side Delaware 1 into Delaware Seashore State Park. The Charles W. Cullen Bridge rises by the frontage road to span Indian River Inlet. Photo taken 06/18/12. A Delaware 1 trailblazer directs motorists from Indian River Marina back to the state route along Inlet Road north. Photo taken 06/18/12. Delaware 1 spans Indian River Inlet southbound en route to Bethany Beach and Fenwick Island from Delaware Seashore State Park. North from Inlet Road, the state route remains through the state park to Dewey Beach. Photo taken 06/18/12. Access roads join both sides of Delaware 1 with the Delaware Seashore State Park campground and day use area south of Indian River Inlet. The service road passes under the Charles W. Cullen Bridge just east of the campground area. Photo taken 06/18/12. Trailblazers direct motorists from the Delaware Seashore State Park day use area along the Atlantic side to the South Inlet Road access roads for return access to SR 1. Photo taken 06/18/12. Turn Point Road runs along Indian River Inlet to the east side of the Charles Cullen Bridge between a waterside subdivision and the Delaware Seashore State Park campground area back to SR 1. Photos taken 06/18/12. Old Landing Road ventures north from Warrington Neck off Indian River Bay as a suburban road to Delaware 1 (Coastal Highway) at Midway. Photo taken 06/18/12. Canwit Drive east ties into the access road linking U.S. 13 (Dupont Boulevard) with the South Smyrna Interchange of Delaware 1. Photo taken 12/31/16. The Smyrna Bypass portion of Delaware 1 wraps around the east side of town across Mill Creek, Delaware 6 and Duck Creek. The Dover Bypass runs just east of U.S. 13 (Dupont Highway) and Cheswold to the Scarborough Road connector at north Dover. Photo taken 12/31/16. "New Indian River Inlet Bridge To Open To Traffic On January 20." DelDOT, press release. January 10, 2012. "Indian River Inlet Bridge Open to Traffic." DelDOT, press release. January 20, 2012. 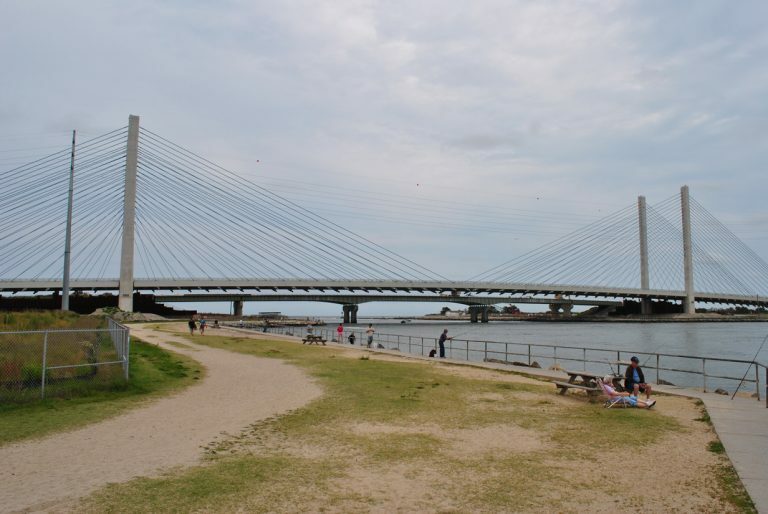 "A bridge for this century: Charles W. Cullen Bridge opens at Indian River Inlet." Coastal Point, May 25, 2012. 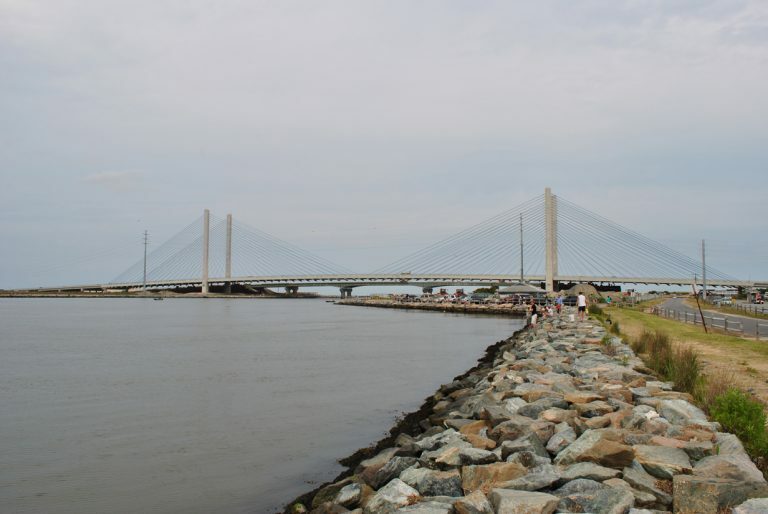 "Delaware probes Indian River Inlet Bridge cost." Roads and Bridges, November 13, 2007. Indian River Inlet Bridge. DelDOT project web site, accessed January 27, 2017. Route 1 Expansion Project from Route 24 to Route 9/Five Points Intersection http://www.deldot.gov/information/projects/sr1_expansion/index.shtml, DelDOT project web site. "DelDOT: SR 1 Thompsonville grade separated intersection now open to traffic." Milford Chronicle (DE), November 10, 2016. "Barratt's Chapel Road work just the start." Delaware State News (Dover, DE), June 14, 2015.